Of all the destroyers in action at Okinawa in 1945, only a handful emerged without damage. Outstanding among these, logging 63 consecutive days and nights on station, was a ship with a really good ball t5am, an ice cream maker and a piano on board, and even a dog that had puppies on her way home from the war, USS Van Valkenburgh, DD 656. The “Van” was one of the last 2,100-ton Fletcher-class destroyers and only eight months old when the Okinawa campaign began. The seventh of seven destroyers built at Gulf Shipbuilding Corp., Chickasaw, Alabama, she was laid down 15 November 1942 but not launched until 19 December 1943 and commissioned only on 2 August 1944, the 169th of 175 ships of the class. Her sponsor at launch was Mrs. Marguerite Van Valkenburgh, widow of Capt. Van Valkenburgh, who had commanded USS Arizona at Pearl Harbor 7 December 1941, and at Van Valkenburgh’s commissioning ceremony at the Alabama State Docks in Mobile, the ensign hoisted was the one Arizona had flown that day. At the beginning of her World War II career, Van Valkenburgh served as flagship of Destroyer Squadron 58, the last of 19 squadrons of 2,100-tonners formed. Both her captain, Cmdr. Alexander B. Coxe, Jr, and squadron commander, Capt. Alvin D. Chandler, were veterans of the Solomon Islands campaign. After shakedown in the Caribbean and the Atlantic, Van Valkenburgh passed through the Panama Canal on 27 October 1944, continued training off Hawaii and then, with Destroyer Division 115, joined the Fifth Fleet at Saipan in time to prepare for the Iwo Jima landings. Arriving off Iwo Jima on 19 February 1945, Van Valkenburgh took part in bombardments there, then sailed for Okinawa 27 March 1945. Attached to Task Force 51.2 for the Okinawa landings on 1 April, Van Valkenburgh’s division formed part of a “Demonstration Group” that approached the island’s southern beaches while the main landing force approached from the west. Immediately, a suicide plane crashed nearby LST-884, but the Van successfully joined fire fighting efforts and the ship was saved. Resignated flagship of Destroyer Division 48 with Ammen and Mullany attached, Van Valkenburgh served as a fighter direction ship on radar picket stations for much of the time from then through 24 June, three days after resistance on land ceased. During that time, she stood by three other destroyers when they were hit—Daly, Douglas H. Fox and Shubrick—but herself remained undamaged while setting an endurance record surpassed only by that of Barton. For this she received the Navy Unit Commendation after the war. 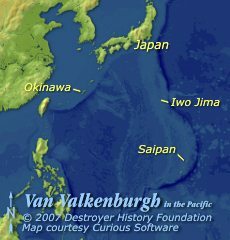 Following the Japanese surrender, Van Valkenburgh entered Nagasaki Harbor and remained in Japanese waters for six weeks before taking departure for Charleston, South Carolina. Decommissioned 12 April 1946, she recommissioned 8 March 1951 for the Korean War. Arriving in Japan on 17 June, she screened fast carriers as they attacked North Korean forces ashore and later joined the “bomb line,” shelling inshore enemy positions and expending more than 2,400 rounds. Van Valkenburgh decommissioned again 26 February 1954 and remained inactive until she was loaned to the Turkish Navy in 1967, serving as Izmir (D-340). Turkey bought her in 1974 and she continued to serve into 1980. In addition to her Navy Unit Commendation, Van Valkenburgh earned three battle stars for her World War II duty and received one for Korean War operations. Sources: U.S. Naval Institute, Lest We Forget, Proceedings, December 2002, DANFS, Destroyer History Foundation database.